What better time to write about the linking of London and Charles Dickens (1812 – 70), the world’s most famous all night walker than the wee hours of the morning? During a bout of insomnia, when my frozen shoulders tend to grumble their loudest, I began to write this feature. Far from being idle during his nocturnal jaunts, Dickens busily made mental photographs of hitherto unnoted nuances of the corners and byways of this vast, ever wondrous city in all its squalid, rich, crowded, lonely, fog enshrouded glory. Surely no author was ever more closely intertwined with the landscape of his novels than Dickens. So much so that his stories and their vivid details have come to epitomize Victorian London in the minds of his readers. In addition, many historians credit Dickens with enabling the idea of ‘childhood,’ as well as, (along with the Victoria’s Prince Albert) furthering the celebratory notions and trappings of Christmas, such is the persuasive power and allure of his picaresque story-telling. Dense crowds at this exhibition a good four months into its run confirmed Dickens’ enduring ability to enchant, enlighten and inspire. There’s a hush at the entranceway of Dickens and London, almost as though one’s about to enter a shrine. 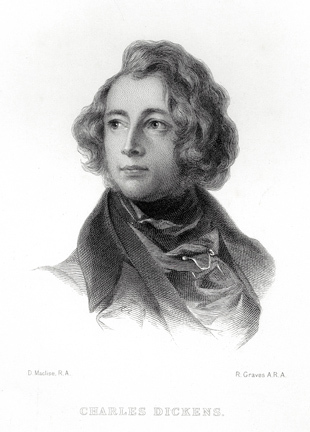 A likeness of young, long haired Dickens projected on the wall, seemingly watches as you pass, on your way to a wall of photos of his family and friends, among them, wife, Catherine, Vanity Fair author Wm. 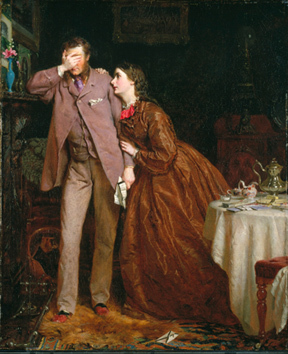 Makepeace Thackeray, painters John Ruskin and Millais, and Dickens last love, actress Ellen Ternan, looking for all the world like the much revered Victorian archetypal ‘angel in the house.’ By all accounts, Dickens was ever entertaining notions of such angels in his literature, albeit, sometimes through his opening, scene setting subtext or the subtext itself, as in the case of tawdry but selfless Nancyand the protagonist’s outcast young mother, who dies giving him illegitimate birth in Oliver Twist. The two illustrators so intertwined with the Hogarth influenced images of his stories in our minds when reading Dickens, George Crukshank and Hablot Knight Browne (‘Phiz’) are also represented here and seeing their drawn, but none the less animated for it work is almost akin to meeting old friends. In the atmospheric room, ‘A City of Imagination, the sounds of chiming clocks fills the air and we stand before a triptych of large panels, each carrying on from the other, collectively offering a panorama of Victorian photographs: street scenes, replete with a tangled mass of horses and carriages, coaches (as in coach and four), be-gowned ladies and starched, immaculately dressed, top hatted gentlemen. Other, darker, grittier images, of wharfs and warehouses, crooked lanes and shuttered, sparse looking houses beguile, as though luring one down the wrong path, as fog, (the only moving portion of this montage of rather 3-D images) sureptiously swirls. The creaking wood of ships and wharves, and the wonder of the age, steam, burst forth to accompany corresponding images. So effective are the slowly changing landscapes on the aforementioned panels that it is easy to feel immersed in them, transported, to another time - that of Dickens London. Two hundred years after his birth, his works still take us there. Signs from businesses long gone in the mist of time hang above, recalling Mr. Fezziwig’s thinking in A Christmas Carol that he would prefer to die out with his ‘old ways.’ This is the world that Dickens brought alive for his readers, albeit, at times, with doggedly cheery impoverished characters - his way of humanizing those dehumanized by fate for those in a position to help. In an era when only the privileged or clergy were educated, few others could read. Picture if you will, the latest installments of Dickens’ novels being read aloud to hoards of eager listeners. Physical examples of such installments here make that prospect a much more tangible reality. Explorations of the ways Dickens made the poor more ‘palatable’ to the rich in the exhibition include reminders of his clever use of names to denote characteristics, physical or otherwise, good or evil, i.e. 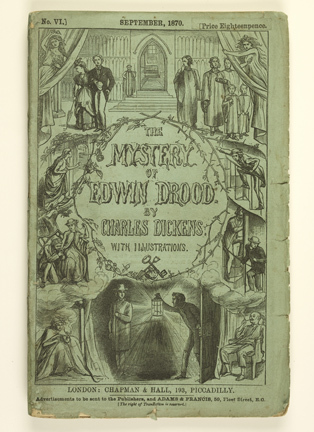 twisted, cunning Uriah Heap in David Copperfield, and evidence of tenderness despite squalor, i.e. the aforementioned prostitute Nancy in Oliver Twist. 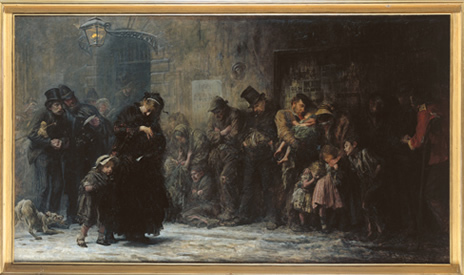 Following on from allusions to Dickens’ philanthropy and humanity through his work, in which he ever seeks to put a face on the huddled masses on the cold streets of Victorian London, are references to his involvements with a number of causes, among them, the Ragged Schools, which he and Lord Shaftsbury both contributed to for the betterment of the poor. It is also known that Dickens became involved with a school for ‘fallen women, Urania Cottage, taking, what was for that time, an open minded view of prostitutes as victims of society, rather than manipulators. Hence his sympathetic slant towards Nancy. 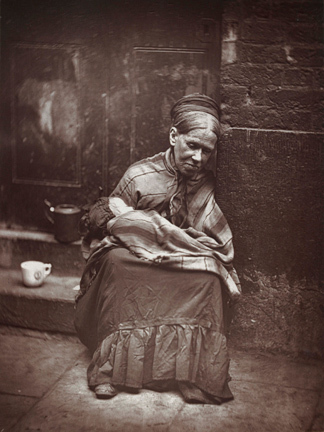 Ever in opposition to the Poor Law Amendment Act of 1834, which deemed ‘outside relief’ null and void, forcing poor families to endure separation and intentionally harsher conditions in the many workhouses being erected specifically for the purpose of punishing the poor, where they were made to work long hours and exist on a pared down diet of gruel, watered down soup and bread. Despite the fact that several scandals occurred during the period this law was enforced (1834 – 47), and riots in opposition to it even broke out in some places, it was not altered until 1847 and, amazingly, not abolished until 1948, when the post WWII National Assistance Act replaced it. However, as research for my dissertation Social Realism in British Film 1959-1969 revealed, in 1966, women and their husbands were still being routinely separated when they became homeless through no fault of their own, as illustrated in Ken Loach’s film, Cathy Come Home, a portions of which were secretly filmed in a former workhouse on London’s Walworth Road. In 1966, when the film was made, men were still being excluded from living in shelters with their wives and children, furthering homelessness, and breaking up families. Public outcry in the aftermath of this film led to the forming of the homeless charity Crises, and eventual changes. Dickens direct response to the cruel insensitivities of the amended Poor Law was Oliver Twist. The parallels between the debates now brewing in Parliament and the unjust laws already passed very quickly last year, and enforced, despite widespread public opposition, which make life more difficult for the poor, elderly, and disabled as in the Victorian era, are sad irony, to say the least. An actual list of the ‘food’ allocated to the poor in a workhouse is also on show in this exhibition, as is a tribute, in verse form, of the same boot black twelve year old Dickens repetitively glued labels on when he’d worked in their warehouse while his family was in the Marshalsea prison for debt, obligingly penned by him eight years later in his first newspaper job, writing for a new evening paper, the True Sun. 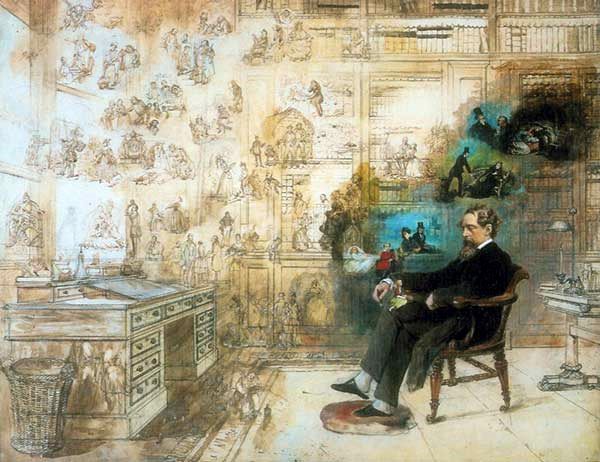 A fascinating room relating to Dickens life-long fascination with theatre, ‘Amusements of the People’, reveals the Victorian fad of tinseling and colouring images of famous actors, purchased plain, then embellished later at home. Apparently Dickens enjoyed this past-time as well; one wonders how he found the time to indulge in it. Such nuances of everyday life, from whatever era you chose to focus on when you visit, are one of the main reasons why visiting the Museum of London is always so interesting. A listening apparatus with head phones speaks of Dickens sharp ear for colloquial accents, followed by audio demonstrations of same. It is both impressive and very entertaining. 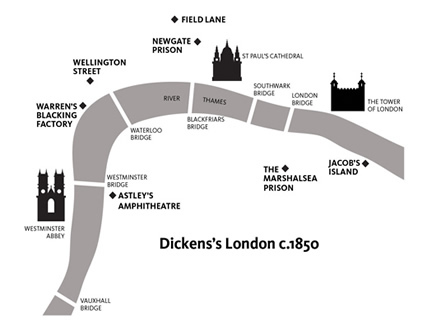 Dickens is as much a part of his own myth, as he is an intrinsic part of the history of London itself. As a young author, he attained success with his first novelistic venture, Pickwick Papers and never returned to a story once it was completed, making each a unique experience, with the most loyal fan base imaginable. The presence of a ‘Pickwickian handkerchief’ with the face of young Dickens as its centre and likenesses of characters from the novel surrounding him stretched across the back of one the glass cases, is as early an example of merchandising as I can ever recall seeing. The fame of the man was instantaneous and far-reaching and the popularity of his works shows no sign of receding. 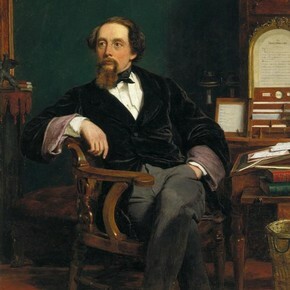 Though I often hear it said that Dickens is second only to Shakespeare in terms of literary greatness, I’m inclined to question that, as Shakespeare requires the three dimensionality of performance to bring it fully to life, whereas, Dickens works need only the imagination springing from his agile use of words to live. Many fine examples of Victorian art are also intermittently hung throughout the exhibition, furthering points relating to Dickens novels, quotes from which decorate the walls above. In one such work, The Port of London Custom House and Buildings Looking West (1838) by Thomas Allom, a man struggles to take travelers across the Thames in a row boat, as he no doubt, had always done, while steam-boats chug along, generating ripples of until that time, unfathomably fast moving waves, further illustrating the paradox of Victorian modernity versus long held traditions. Such is the focus of the ‘Dickens and the Modern Age’ portion of the exhibition. Penny post was invented during his lifetime and apparently, Dickens made the most of it, frequently corresponding with friends. A very detailed model of a Post coach is here, along with a description of how much Dickens enjoyed racing in them on rainy days, when mud splattered their windows. It all conjures up colourful images of the London he so vividly portrayed. On a grimmer note, in the ‘In Life and Death’ room, a small coffin lends a gloomy presence inside a glass display case, though crowds prevented me from drawing nearer. Instead my eyes rest upon a great painting of despair – Applicants for Admission to a Casual Ward (1874) as rendered by Sir Samuel Luke Fields. In this great oil on canvas, viewers are privy to the anguish of the poor and destitute, lined up to become unwitting residents of one of London’s many workhouses. When first shown at the Royal Academy, this chilling painting was ‘accompanied by a quote from a letter by Charles Dickens describing a scene he had witnessed outside the entrance to Whitechapel Workhouse. Only after Dickens death did the harsh realities of his own childhood emerge, through his friend and biographer, John Forester. Luckily, before the surging Saturday crowd is able to carry me out of the room, someone shifts and I’m able to stand before one of the podiums Dickens designed himself to give readings from. It is waist high. I discovered when I stood before an empty suit of his clothes at Dougherty Street house on a Christmas tide past that Dickens was the same height as me. An account of a reading says his enactments were so strong that sometimes someone in the audience fainted during the scene in which Bill Sikes murders Nancy. Despite cheerier aspects, there are no happy endings for the poor. Oliver was heir to a fortune. The Houseless Shadow (2011), a respectful, well assembled, and evocative film by William Raban accompanies lines (with English subtitles) from Dickens atmospheric essay, ‘Night Walks’ (1860), aptly capturing its wandering, alternately desperate and pensive mood, despite its contemporary settings and scenes. It forms a fitting tribute to Dickens ability to paint imagery through his lyrical use of language. That said, as I wandered among the multitude of displays of this exhibition, those I found most captivating of all were the original manuscripts of Dickens hand written novels, among them, Great Expectations, the first book of his I’d ever read as a young teenager, which had so captivated my imagination then, and continues to do so to this day. Looking at these well inked, familiar lines, one could almost see Dickens at his staunch wooden desk, his quill scrawling across page after page, over the edges and beyond, into the annals of history. Editor’s Note: A return visit to this exhibition, in hopes of finding it a bit less crowded worked a treat, as a late afternoon slot proved to be one with greater scope for lingering, more imaginative viewing. I might add that having seen some of the artifacts here before did nothing to diminish their impact or importance in the eyes of this Dickensian enthusiast, on the contrary, I was enabled to relish to my heart’s content, and learn as I went. For example, had I been wise enough to put my visit off to a week-day afternoon initially, I would have quickly understood that the quotes scrawled on the walls above each display serve as a guide and give clues as to the choice of objects around it…Nevertheless, be sure to visit and revisit, this comprehensive and informative exhibition!